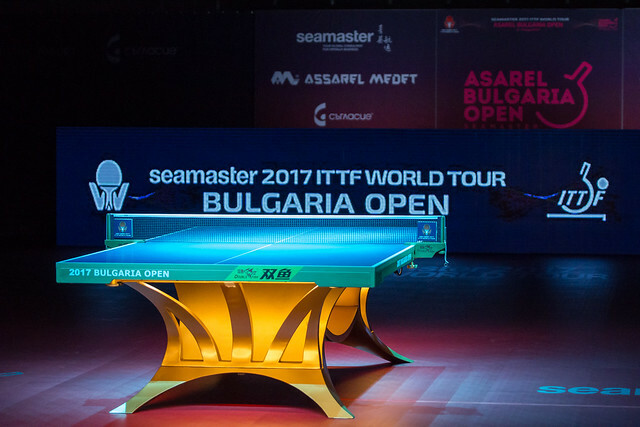 Shocks have been plentiful but on the penultimate day of action, Saturday 19th August, at the Seamaster 2017 ITTF World Tour Asarel Bulgaria Open in Panagyurishte, the favourites for gold are very much in evidence. Germany’s Dimitrij Ovtcharov, Japan’s Kenta Matsudaira and Nigeria’s Quadri Aruna, the respective top three seeds in the Men’s Singles, all appear in the quarter-final draw. Likewise, in the Women’s Singles event the leading ladies are all present; in a round that witnesses Japanese players in entirety, the top four names in the guise of Kasumi Ishikawa, Mima Ito, Hitomi Sato and Honoka Hashimoto are all in the quest for honours. The problem they face is that there opponents have very little to lose; they can play in a relaxed manner, take risks and who knows what might happen. In the Men’s Singles event, Mizuki Oikawa, the winner two days earlier of the Under 21 Men’s Singles title is full of confidence. He faces Dimitrij Ovtcharov. Also in the top half of the draw, Quadri Aruna confronts an in-form qualifier; he opposes Asuka Machi, also from Japan. Intriguing but in the lower half of the draw, the possibility of a quite unique situation is presented. Could brothers meet in the semi-final? In the round of the last eight, Kenta Matsudaira meets Jin Ueda, the no.5 seed; elder brother, Kenji Matsudaira opposes fellow qualifier Kenta Tazoe. Meanwhile, in the Women’s Singles quarter-finals, Kasumi Ishikawa meets qualifier Asuka Sasao; Mima Ito opposes Sakura Mori, the no.5 seed, whilst Hitomi Sato confronts Miyu Kato, the no.8 seed. Occupying the top three seeded places, Kasumi Ishikawa, Mima Ito and Hitomi Sato start as favourites but for Honoka Hashimoto, the no.4 seed, danger looms. She faces Hina Hayata, the no.6 seed in the round of the last eight. On the ITTF World Tour, the two have met four times, all in 2016; Hina Hayata has won all four encounters. In fact she has surrendered only one individual game in those contest; that was the most recent duel when they met at the quarter-final stage of the Under 21 Women’s Singles event in Austria. Can Honoka Hashimoto turn the tide? Whatever the outcome, at the close of play, the finalists in both the Men’s Singles and Women’s Singles events will be known.